I am still at the outlining each "card" on the panel, using Sulky 40-wt gold rayon, but already I am loving the way it is quilting up, loving handling the layers. I keep peaking at the back, and it gives me a small thrill too. Although I LOVE my Avanté, and the (steep) learning curve I am on as I practise and practise on her, I will never lose my love of quilting on my DSM, my beloved Bernina. 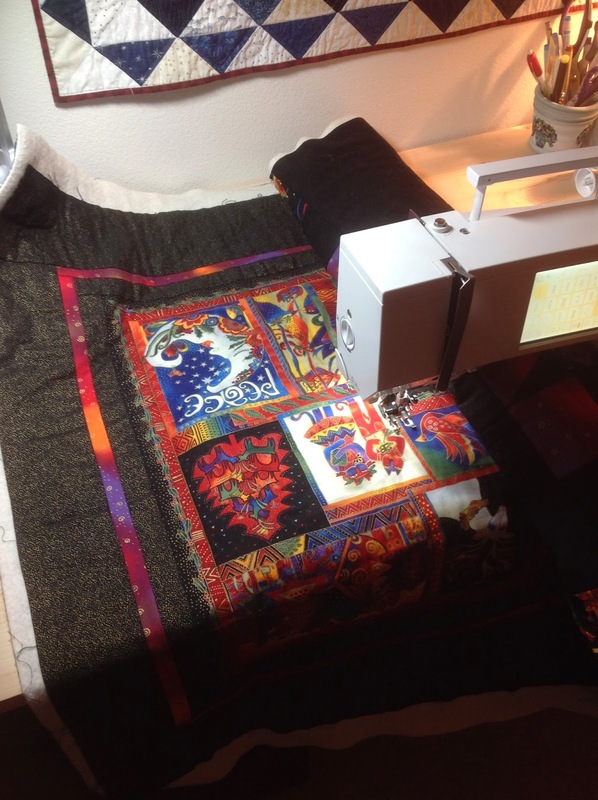 The machine quilting set-up here is not the greatest, but as the music plays, and the rhythm of the machine soothes me, I find myself calming down and realizing this too, shall pass. Sidenote about the QBS: do you see those annoying wrinkles from excess fabric due to the wonky unsquare panel? I was able to gently lift and smooth out one or two here and there. I will continue to do so as I work on this quilt. I am hoping the quilting in the final border will help to distribute and/or disguise the fullness. I wanted to point out that one is able to do this, that the QBS is still tacky, more than 24 hours after I basted this quilt. In my past experience, it will continue to be tacky for many many days. For you to correct an intrinsic error in the quilt that wasn't your doing must take talent. It'll turn out great!